If you live or work in close proximity to more than one Slide stop, you now have more options of pick up location and therefore more times. Book your ride as normal - enter date, number of passengers, FROM & TO and time. Ride options will be displayed along with a new button * More pickup options in between shown times, this indicates additional ride options are available for this search. Click the * More pick up options and you will see additional options. The new options will be shown in bold, they may have a slightly longer walk of a few minutes, walking time is shown next to the pick up and drop off times. Also see a new part of your local area ! Walking map clearly shows you the way to alternative stops and the combined walk & ride time is shown along with the fixed price. 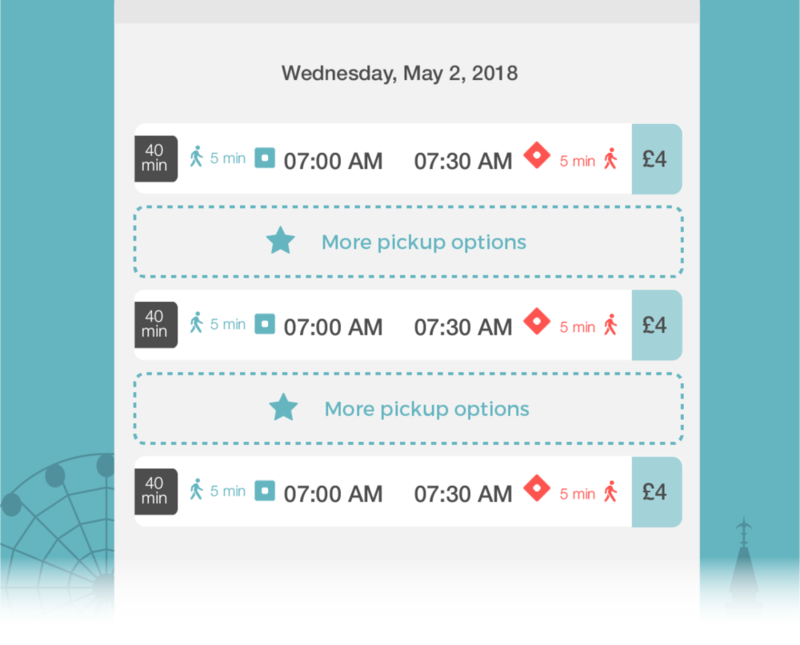 Alternative stops provides you with more choice of times and locations, often an alternative pick up location may provide a shorter overall journey time. The choice is yours - current pickup and drop offs remain, these are additional nearby locations.